Wetherspoons: All different, yet all the same. We are not quite regulars in our local Spoons, but it would not be irregular to see us in there. Wetherspoons are usually converted theatres or cinemas. We went to one once that was formerly a police station, in tact with its policey paraphernalia. You’ll always find nice toilets and grand mise en scene. But it also serves food. Rapid and delicious and the price is right. 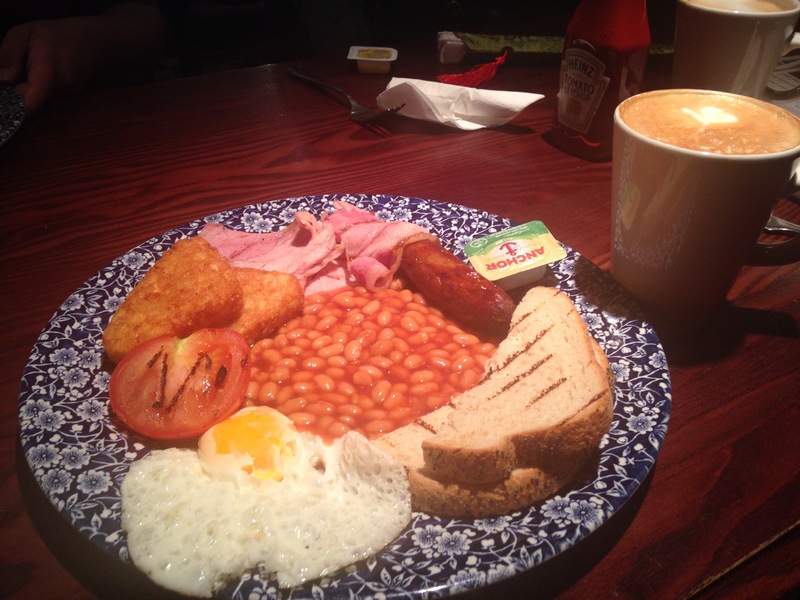 To be hungover is the prerequisite of a Wetherspoons breakfast. We get the basic full English, £3. We always start with a latte. Wetherspoons lattes are surprising perfection. Creamy goodness in a real cup that rivals Waitrose godly perfection. And then commenseth a salty medley of deliciousness: Bacon – sometimes too salty, even for a pair of salty sea dogs like ourselves, but it at least resembles bacon unlike the tripe we ate at Subway. Egg – we concur that the white bit of egg tastes simultaneously of nothingness and fart. Luckily spoons manages to cook the egg well enough to negate that foul taste. Beans and toast both unobjectionable. Obviously one has to move posthaste to butter the toast lest it not melt as well as possible. Sausage – delicious sausagey goodness that is congruent with the ensemble breakfast but would be objectionable were it served alone. And finally the star of the show, hash brown. Golden angel’s droplet of goodness. A Pyramid of deliciousness. All this will leave you with a mighty thirst for beer. Luckily, you’re in the right place to sate your thirst.